With Interstitial Cystitis most patients experience the following three symptoms: pain, urgency, and frequency. Ladies with IC will notice that they have the urge to go quite immediately. Other ladies, if they don't make it to the restroom in time, may actually leak a little bit of urine. Other ladies don't experience a lot of urgency but do experience a lot of frequency. There are also some women who may experience pain in conjunction with other symptoms which can be very difficult and incapacitating. Women need a good treatment for IC that also helps with cystitis pain relief. 2. The triangular area in the middle is called the Trigone. The Trigone is where the two ureters deposit urine into the bladder. 4. The urine leaves the bladder through the urethra. Think of the urethra as a tube and the bottom portion of that tube is also estrogen dependent. So when your estrogen is low, and that lining becomes thin, then you are more likely to leak urine with you cough, laugh, or sneeze because that lining can't completely close. Hopefully new treatments for interstitial cystitis will help! Why do patients have the symptoms of urgency and frequency? When urine leaks through damaged bladder lining it hits the mast cells in the muscle of your bladder. The muscle of your bladder works just like the muscles in your nose-- they release histamine. So when the urine hits the muscles, histamine is released causing the lining of your bladder to swell and become irritated. When the bladder wall swells, the nerves on the outside of the bladder that are there to tell our brain when our bladder is full, are triggered and your body tells you that it is time to visit the restroom. The signals from the bladder that are causing pain go to a different part of the brain. When that part of the brain is triggered, it sends a variety of signals down to the bladder which causes tremendous bladder spasms. Unfortunately there is nothing to do for a bladder spasm but wait it out. Treatment of interstitial cystitis can help prevent future spasms. Over the counter medication, Prelief, can help provide Interstitial Cystitis pain relief when trigger-foods are consumed. Patients with low estrogen will need to be prescribed a form of estrogen to balance out their hormone levels. One of our new treatments for Interstitial Cystitis is realizing that hormones play a big role! If you eat a high acid diet or consume “trigger foods,” your urine could potentially be causing you more pain and leave you with an increased need for Interstitial Cystitis pain relief. A medication called Prelief is available that neutralizes your urine. You can take this at the same time of your meal/drink to help minimize effects. Also make sure that you drink plenty of water! The more water you drink, the more diluted your urine will be, and thus less acidic. Staying hydrated is perhaps the easiest treatment of Interstitial Cystitis and can provide cystitis pain relief. When you have IC your mast cells are releasing histamine which causes inflammation of the bladder. We need to combat this by taking an antihistamine. Claritin, Zyrtec, and Allegra are all anti-histamine medications that are available over the counter and provide some treatment for IC. When your bladder is full, sensory nerves send a message to the brain telling you to go to the restroom. Patients with IC may experience this more often than necessary. Elmiron, a prescription treatment of Interstitial Cystitis, is used by inserting the medication directly into your bladder that we mix here in our office. It consists of a bicarbonate which neutralizes your urine, lidocaine which numbs the bladder, heparin which helps rebuild the lining inside the bladder, and Elmiron which helps with healing. Patients are asked to hold the solution in the bladder for four hours before voiding. The success rate for alleviating symptoms, providing cystitis pain relief, and treatment for IC is about 90%. For patients with pain, things get a little more complicated-- cystitis pain relief is a challenging aspect of IC. The longer the pain signals have been going to the brain, the harder they are to reverse. One treatment of interstitial cystitis pain relief is PTNS (percutaneous tibial nerve stimulation), or Tibial Nerve Therapy for short. It is a way of blocking the nerves going from the brain to the bladder. This is done by inserting a small acupuncture needle into the tibial nerve in your ankle that sends a small, painless frequency up to your spine. It provides the same effect as would an epidural where we have blocked your signal path for pain. PTNS is blocking all of the signals to your bladder during your session (typically 30 minutes). This is an attempt to retrain the brain not to send these pain signals to your bladder and provide cystitis pain relief. These treatments are done twice a week for six weeks, at minimum. The success rate for this treatment is about 70%. We have been doing Tibial Nerve Therapy for many years but generally it is considered one of the new treatments for interstitial cystitis. Considered a chronic condition, there is no cure, only treatment for IC. Once we get your frequency, pain, etc under control we can back off of other treatments as your bladder goes into "remission.” Don't despair. There are a lot of good things we can do to help your symptoms and get you back to normal. By using our proven treatment for IC along with new treatments for Interstitial Cystitis, we can help improve your quality of life. A little humor can go a long way when you've been diagnosed with interstitial cystitis. We saw this comic and couldn't resist putting it up on our site. We hope it makes you smile! 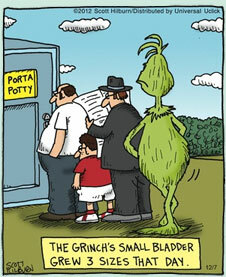 This comic is © Scott Hilburn and has been distributed by Universal Uclick.